Dave Splash Dot Com: The Walking Dead - "Secrets"
The Walking Dead - "Secrets"
Another excellent episode of The Walking Dead was on last night; and it should have been titled, "The Rise of Andrea," rather than "Secrets." Yes, there were secrets revealed. But, to me, the most memorable aspect of the episode was Andrea's taking out of some walkers with her newly perfected shooting skills. She shot more than a handful right between the eyes. She can thank her tough love training style, courtesy of Shane. And later on in the episode...she did thank Shane (nudge nudge wink wink). Regarding the secrets revealed, Glenn proved that he is the wrong guy to tell one to. He was the only one who knew about Lori's pregnancy and about the secret stash of walkers in the Greene's barn; but by the end of the episode, he wasn't. He told Dale who is among the biggest blabbermouths of the group. Naturally, Dale chose to confront both situations (and also confront Shane, who showed off his inner psycho) rather than keeping his mouth shut. As I expected, the walkers in the barn are family members and friends of the Greenes. 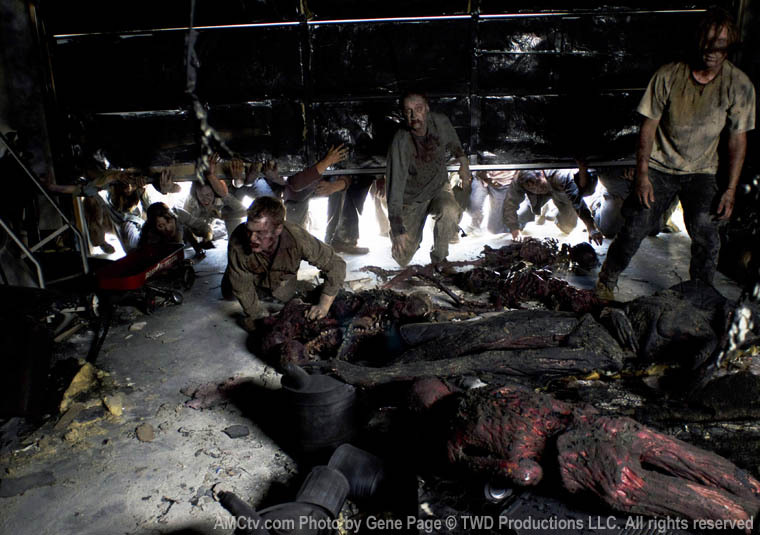 They view the walkers as being sick, and that someday there will be a cure. 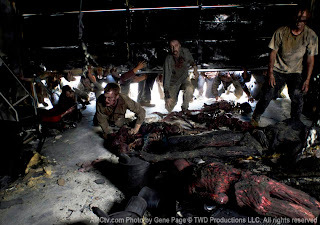 They don't seem to have the same sense of urgency that Rick, Shane, et al do about the threat from the walkers. This is also why Hershel disapproves of shooting the walkers. I have a feeling that this naivete will result in the deaths of much of the Greene clan. We'll certainly find out soon enough because the secret is out. The other big reveal last night was regarding Lori's pregnancy. She dispatched Glenn to make another run into town. This time, however, she requested the "morning after" pill to end her pregnancy. 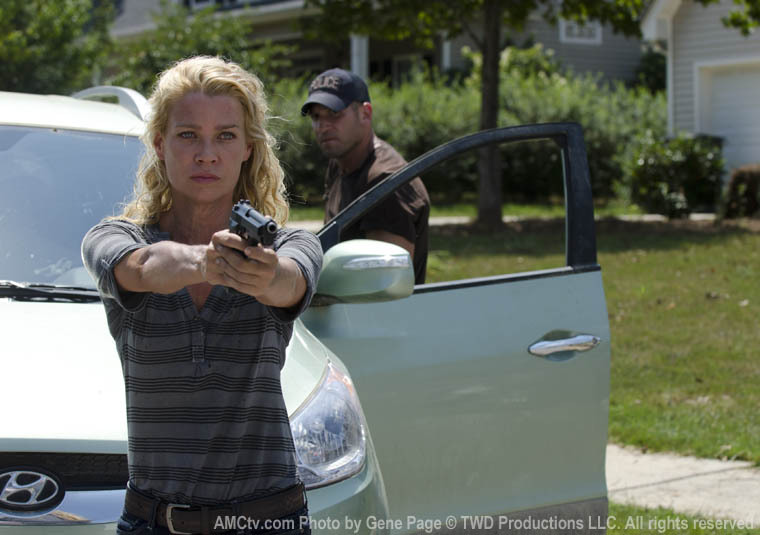 Maggie, once again, accompanies Glenn, and the two get into a heated debate over the walkers in the barn. The two get attacked by walkers inside the drug store, and I believe that changed Maggie's views about how to deal with them. In her anger and panic about the attack, she yells at Lori about her "abortion pills." Rick ultimately learns the news about the pregnancy and that Lori had thrown up the pills after taking them. He also tells her that he has known about her and Shane for a while now, and understands why. I have to say that Rick is seeming awfully understanding about the whole thing. I wonder whether or not that will change. I see a division inside the group regarding the path forward. I don't see the Greenes allowing the group to stay much longer, especially once they are confronted about the walkers on their property. But Shane's new relationship with Andrea, and her new aggressiveness, could cause a rift or split among the original travelers. Dale is already very suspicious of Shane. So much so, in fact, that Shane actually threatens him. Dale, being the nosy guy he is, will no doubt bring his concerns to Andrea. She will want to hear none of it. I could see the group splitting in two with some of the Greenes leaving the farm and joining one of the groups. I'm sensing all of this will come to a head next week at the mid-season finale. We'll see if I'm right.